Arrows - These make great Arrow of light ® Awards. We feature Beaded arrows with Blue and Gold beads and Scout color fletchings. 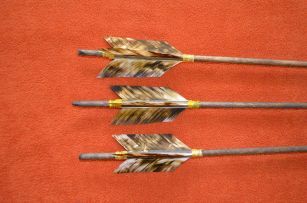 Bone tip Beaded arrows - $17.00 average length is 25.5"
Made by Leo Holiday, Leo is Navajo. These feature sand filled bead work. Bone tip Blue and Gold arrows - $15.00 average length is 25.5"
Bone tip arrows - $14.00 average length is 25.5"
Bone tip spotted fletchings arrows - $15.00 average length is 25.5"
Feathers are square cut Bronze turkey, one of our fanciest Arrows! These arrows are by Lavern Little, Lakota Sioux. 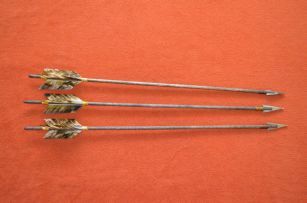 Arrows are 29 to 30 inches long. Laverne hand harvest all of the Reed shafts on these himself. Then painstakingly runs them through a cut rock to break the fibers in them to straighten them out. He then uses a Leather glove to rub oil into the wood “Schucking” the bark remains and bending and smoothing them. to allow them to dry straight before he begins construction of these arrows. 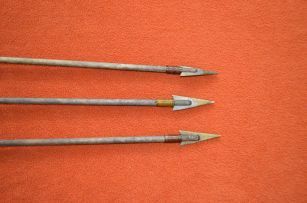 These arrows are the constructed with sinew, stone tips and Laverne's painted feathers. He notches his shafts and hand wraps the Stone and feathers with Sinew using no Glue at all. These are very authentic frontier days arrows. Notice the notch he uses at the feather end of the Arrows. He carves out a ring before the notch to pull the arrow back in the Bow to shoot. A nice and unique touch.